Apart from the River Blyth and its tributary the River Pont, the source of which lies further West from the estuary than the source of the River Blyth itself, there are twenty-six named burns and sikes which feed into the River Blyth. This is about the interesting sites and settlements along the valleys that share a common connection and heritage. 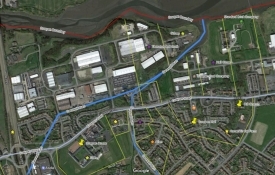 The River Blyth is about 32km (19.9m) in a direct line from source to mouth. It is 44.9km (27.9m) travelling along the river. The River Pont is 37km (23m) in a direct line. It is 32.7km (20.32m) from source to confluence approx. It is a smaller cousin of its neighbour the River Tyne which is approximately 107km (66.5m) from the source of the North Tyne near Keilder to the mouth. The River Blyth rises near Kirkheaton at about 200 metres (656ft) above sea level, not much less than the source of the Tyne as it happens. 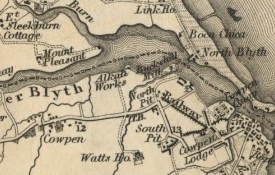 The Port of Blyth is an artificial harbour which was once fordable near the mouth of the river, similar to the way the River Wansbeck continues to be. How Burn rises at Sir Edward's Lake which is part of the Capheaton Hall estate. Capheaton Hall, built by Trollope, according to Pevsner, was "the first unfortified substantial house to be built in Northumberland" after the violent and turbulent middle ages and Civil War period. The Swinburnes had been in possession of the estate since the late 13th century. They backed Charles I during the Civil War and ended up being exiled when the King was beheaded. They returned during the reign of Charles II and built the hall in 1688. The Swinburnes were staunch Catholics, but luckily for them their lands were not sequestered during the Jacobite rebellion of 1715. The leading Swinburne was on his death bed attended by his sons who played no part in the rebellion. The Earl of Derwentwater was a cousin of the Swinburnes who led the rebellion. He paid with his life, and land, part of which were what we now know as Blyth Town. By 1763 Capheaton was inherited by Sir Edward Swinburne who created the lake and carried out substantial improvements to the house. Still owned by descendants today it is now a hotel and wedding venue. A roman road which ran across this exact spot passing by Great Whittington and Hartburn on its course from the military road to Scotland. Earthworks are visible at Hartburn. 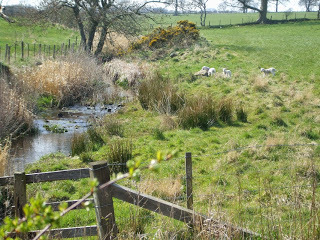 Between the Coal Burn and Ogle Burn it is one of the major historical properties and attractions in the area and is managed by English Heritage. There is much in the way of archaeology and structures of note including Bantam Folly within the estate. This is an ornamental farm building. One of many DMV sites in the area. Earthworks near Middle Newham Farm (There are also East and West Newham farms) indicates a medieval settlement on both sides of the road with remains of at least eight properties. The evidence of medieval farming also still exists in the form of ridge and furrow. One of the prettiest, unspoilt, villages in the whole world, populated by only a few hundred people. It has a picturesque pub and church and now also boasts an outdoor adventure centre. The township came into the possession of the Blackett family at the turn of the 17th century. They were rich merchants of Newcastle, a street acknowledges their influence even today in the city. They built Matfen Hall on the site of an earlier Jacobean house, the residence of the previous landholders the Douglas family, between 1832-5. They then constructed high-quality housing in a self-contained community as an estate village for their workers. The Blackett arms adorn one building in the village with the motto "nous travaillerons en esperance (we will labour in hope). The residents purchased the old red telephone box when it was no longer needed, carried out renovation and turned it into a tourist information hub. Opened as RAF Ouston in 1941. It was first home to Polish Fighter Squadron No 317 who were equipped with Hawker Hurricanes. They sent a Junkers JU88 into the North Sea on the 2nd June of that year, their first kill. After the war it was used as a training facility. During the Cold War, to be made more operationally ready, a runway was extended to 6,000ft. In 1967 Ouston acted as the regional airport for a period of five months when the runway at Newcastle was being renovated and extended. It was for a time during the early 1960s used as a motor racing circuit with both Jim Clark and Jackie Stewart attending meetings here. The airfield fell into disuse when the British Army Albermarle Barracks was sited here in the 1970s. One of the larger villages in the valley it has an association with the Swinburne family as landholders dating back to 1399. A pretty village with an archaic wide village green it is a popular drop in for travellers and tourists especially the Swinburne Arms pub. The Village Lock up, in a prominent place, is an unusual and rare curiosity which dates to the early 19th century. The original chains are still in place on the walls. It was a place for prisoners to be held before a JP could be summoned to deal with the indicted, mostly drunks. It is believed there was an earlier building on the same site. Remains of a village and field system can be seen as earthworks, especially from aerial photography. It had a large village green with houses facing onto this. In the 17th century the landholder moved the inhabitants to other nearby settlements and turned this area into parkland. Pevsner wrote: "A walled garden of the early 17th century is all that remains of the original manor house. In the garden two broken 17th century statues". The current Dissington Hall is now an enterprise hub and conference centre, privately owned from 1968. The house was commissioned by mine owner, from Chirton, North Shields, Edward Collingwood and was completed in 1797. The cairn on Beacon Hill may have been the site of a beacon or large fire used for sending signals throughout the country. There are several such probable beacons listed in this area. Often they were placed on the top of a tall building. A chain of them was lit to warn residents of incoming raiders during the turbulent period of the 14th - 16th centuries. Is a 17th century country mansion which came into the possession of the Ogle family during this century. In 1946 it was acquired by Northumberland County Council and became an agricultural college. It now is also home to a small zoo. In 1788 the Rev Newton Ogle erected an obelisk commemorating the accession of William and Mary in 1689. Lies on one of the main highways between Newcastle and Scotland. The Blackbird Inn was the manor house of the Errington family and includes a former pele tower. A truce between England and Scotland is rumoured to have been negotiated here in 1244. It was said to have been destroyed by Douglas in 1388 while being pursued north by Harry Hotspur prior to the Battle of Otterburn. The river bank has now been turned into a picturesque park and walk. 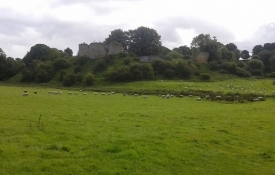 The Ogles were a knightly and influential family in this area since prior to the Conquest in 1066. There are considerable remains and earthworks of their former moated castle and village, now a farm site, which in 1632 comprised 16 houses. They were given a licence to crenellate in 1341. Another major village which was a crossing point on a main route between Newcastle and Scotland. A picturesque village it had a church here by 1190. The present church dates from 1871. Two former hospitals were built just to the North of Stannington. The first purpose-built children's tuberculosis sanatorium in the UK. The hospital open in 1907. This opened as a visitor centre in 1997. Later a zoo licence was obtained. Known as RAF Morpeth during WWII. It was a training site. Some buildings and archaeology still remain but it is now used as a site for a Sunday car boot sale and point-to-point racing. The confluence of the Pegwhistle Burn and the River Blyth, a former quarry with a house built into the quarry face and coal mining area has now been turned into a country park managed by the local authority. An art trail has recently been installed here. was built in 1807 for mine owner and political writer William Burdon. The site of the confluence of the Horton Burn and the River Blyth is the site for a park and picnic area. 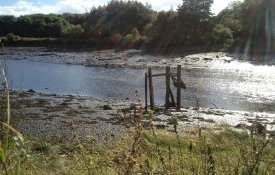 It once was a working mill site and settlement and even had an outdoor swimming pool at one stage. The home of the Ridley family, peers of the realm since 1900. The Ridleys purchased the, estate and Blyth estate, in 1723 and were entrepreneurial in the development of these lands.